The European Financial Marketing Association (EFMA) puts together some of the very best events in banking and insurance worldwide. 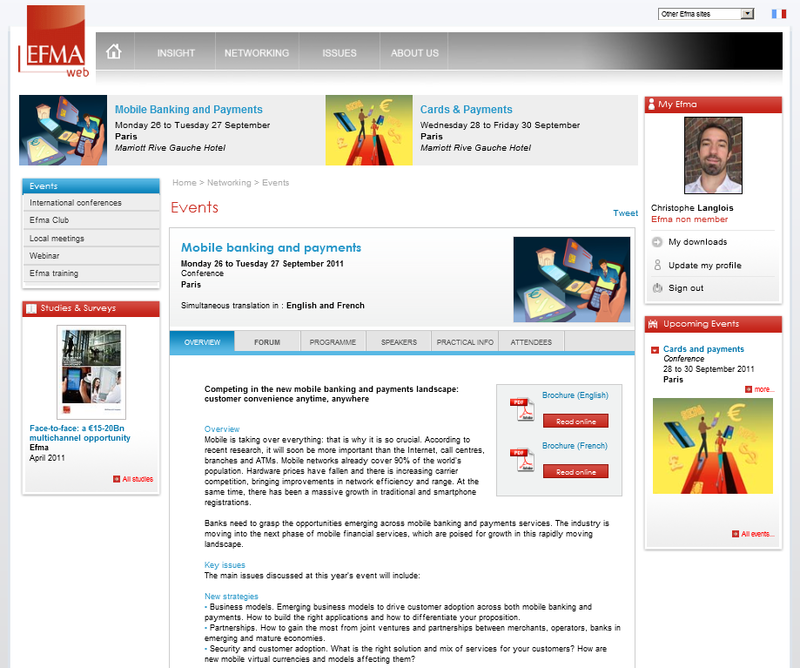 So I was delighted to be invited to contribute to another EFMA event, this time on ‘Mobile Banking & Payments‘. I delivered a presentation entitled ‘Harnessing social media to acquire new customers, co-create, innovate and drive mobile banking’ on the first day of the conference (Paris, 26 September 2011).In my presentation, I talk the audience through my vision of how financial institutions should use social media to accelerate adoption increase usage of online banking. I covered some of my favourite topics: the Voice of the Customer (VOC),crowdsourcing and Know Your Followers/Fans (KYF). I shared a few best practices from the likes of FNB (product launch, South Africa), Webank (co-creation, Italy) and Danske Bank (product roadmap, Denmark). Please note that I didn’t spend too much time on other great examples in the social / mobile space such as Standard Chartered or Banco Sabadell because those innovative financial institutions had some speaking time at the event. By the way, congrats to Kanags and Xavier Marin who both did a great job representing their teams! Aman Narain and Pol Navarro must be proud. If you saw me on stage, I invite you to connect on linkedin. It would mean a lot to me if you could endorse me and my work directly on my profile. And if you are interested in the topic of social media, I invite you to find more information on my first published book ‘customer experience without borders: a practical guide to social media in financial services‘. The 240-page book is packed with invaluable insights and best practices from all over the world. Due to two other speaking engagements in London on 27 September (I contributed to the Financial Services Forum and the Financial Services Club), I couldn’t attend / cover the second day of the event. But as usual, I did my best to cover the event live on social media channels like facebook and twitter. I invite you to check my pictures of the event. Please feel free to tag and/or comment them. And watch this short video to get a feel for the atmosphere. The limited amount of live online coverage has always been a weakness of the EFMA. This time around, I believe we achieved a decent volume of coverage on twitter. We reached close to 500 tweets: about 55% were ReTweets (RTs), and most of the tweets were published on the first day of the event. Congrats to the most active tweeps: @EFMA_News, @INDGroup, @Yakdo,@dionlisle (Dion Lisle, the chairman of the event), @afontao and@desventure007. I decided to crowdsource my wrap up of this first day. It seemed appropriate, don’t you agree? I invite you to find my selection of about 90 tweets for the four sessions. * Paul Mulling HSBC says banking execs realized mobile Banking is here, when they got iphone. Not Blackberry? * KPN and BankInter are on stage now, yes carrier and bank together at the same time – who woulda thought ? * Bankinter issued own SIM card with Kpn to allow real time usage charges on current a/c? * Bankinter is selling airtime, phones, internet and dongles to reach new customer segments. Hard value proposition imo. * Mercantile Bank, innovative, technology-based FI that partners with tech companies vs. building own software. Congratulations! * Great videos from @BancoSabadell and @standchartbreeze, but do they really drive adoption or used for exec/employee buy-in? * Danske bank – mobile interface is a dial instead of drop down , cool interface – why does no one else use it? * Over 2500 people applied for becoming a client at Danske bank through the mobile app. Clear potential for acquisition there! * McKinsey says most payment innovation is from non- bank payment companies – sad, but very true ! * Mobile Banking will fundemantally change retail banking in next 5-10 years. * survey of bankers found about 11% do not believe mobile will change banking? Who are these people ? * Smartphones are the catalyst for the next revolution in the digital commerce. * Ultra-convenient mobile banking is needed, no question. But device technology, network or usability does not allow this yet. * Mckinsey: work + on convenience. Digital commerce, take the bank with you … inside stores. Disrupting new markets. * Great questions. Go-to-marketing strategy: HTML5 or iPhone app? Danske bank: HTML5 is great, but lacks Appstore distribution. * SEB Estonia introduced wireless PKI solution which is the same Mobile signature solution of Turkcell 5 years ago in Turkey. * Christophe from @Visible_Banking on stage : showing examples of how to interact with customer generated content. Priceless! * FNB App. as a good example for Product Launch 2.0. So users share all kind of feedbacks. * Rovio – everything starts with a story + iconic characters + multilevel gameplay = engagement – not just for games – banks ? * Ultra connected means to play Angry Birds on your iPad in front of the TV. How can banking come to any of the display? * Turkish bank TEB is “selling loans through SMS”. Looking forward to hearing more about the use cases. Please note that those tweets were from me and the following 56 tweeps:aenault, afontao, amanwhotweets, aysedemirozer, BankInnovation, Bankinter, bigfafa, cexify, cherylmarquez, desventur007, dionlisle, dobry2000, Efma_news, emel_temucin, EmmanuelViale, estelleneveu, evacastells, ilkerkuruoz, imagdotcom, indgroup, isbecer, jfourgeaud, JinZwicky, JLNieton, justin_fung, kanags, kuojido, Laureenche, majromero, marcushi, mete_gunes, MGR16, MobilePayToday, mobileslate, MyIntersperse, NextBankAsia, norbertsiegers, onemorethompson, Orcun_Onat, pcorominas, PhiloCook, Pole_FIN_INNOV, sahikaoztol, sarahsmile196, sarperA, SophieZG, stanchart, StanChartBreeze, StanChartBreeze, StephenHill27, Steve0253, tek_fin, thebankchannel, tomlindman, xaviermarin, yakdo.